Trim the excess running time from director Gore Verbinski’s latest, and this old-school horror with a lesson would make quite the impression. However, at two-and-a-half hours, A Cure for Wellness is as needlessly overlong as Verbinski’s all-around insufferable The Lone Ranger, and his Pirates of the Caribbean films. At least this time out, the “more is better” aesthetic includes a seductive, creeping atmosphere and mesmerizing visuals. And there’s a clear moral guiding the tale, one that takes shape in the opening scene, where we’re treated to low-angle shots of the ominous steel-and-glass high-rises of a metropolis. In one of those office buildings, someone is burning the midnight oil and on his way to having a fatal heart attack for it, the film’s first overt suggestion that we’re working ourselves to death. His passing means a colleague must travel to a Swiss health spa and retrieve a senior executive whose presence is required for the company’s upcoming merger. That task falls to Lockhart (Dane DeHaan), who does so at the command of company masters that signify merciless corporate evil. From the heart attack, to the sanitarium, to the expression on Lockhart’s face that concludes the film, Verbinski and screenwriter Justin Haythe are elaborately addressing the question, What’s the sense in over-working yourself to the point where you have to go someplace just to feel well again? Shortly after Lockhart’s arrival at the clinic, an accident makes him a patient, and like Dracula’s Jonathan Harker, he’s immersed in a Gothic horror, as the health clinic is also a reconstructed castle with a murderous past that still reverberates among the villagers in the town below. If this sounds even a little bit like a cross between a creaky vampire film and The Shining, sure enough that’s how it plays out. In a calm, Kubrickian way, Verbinski presents his just-so shots of symmetrically framed doorways, windows and hallways that indicate a facade of perfection. It’s what’s below the surface that Lockhart must figure out, as the strange occurrences and discoveries pile up. But what’s refreshing is that A Cure for Wellness is the rare modern horror that doesn’t rely on shock scares. It shows you the unknown dead ahead, and inches you closer. Key to the strangeness of the film is the clinic’s oily director, Dr. Volmer (Jason Isaacs), who administers tiny drops of what he calls “vitamins” to himself, his staff, and a young teenage girl named Hannah (Mia Goth), with whom Lockhart becomes especially fascinated. Despite wanting to leave, Hannah’s put her faith in Volmer, who convinces her everything will soon be alright. 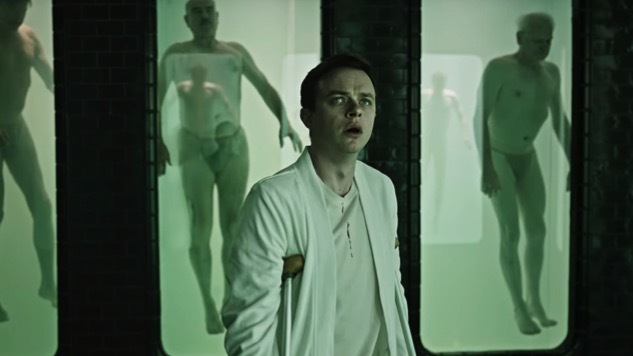 The deranged culmination of Volmer’s plan and A Cure for Wellness make use of classic horror tropes from Frankenstein and Phantom of the Opera, but the conclusion has only a fraction of the resonance of either, because by that point we’ve sat through a few too many false climaxes. Recalling the themes of creators in battle with their creations and the horror of ill-begotten love isn’t the same as developing them with well-scripted drama and characterization. It’s unfortunate that Verbinski diminishes his movie’s impact by stretching it to an unnecessary 146 minutes, because within that bloat is a film whose purpose and vision make it an uneven but intriguing journey.